The rusty patched bumble bee, a prized but vanishing pollinator once familiar to much of North America, was listed on Tuesday as an endangered species, becoming the first wild bee in the continental United States to gain such federal protection. One of several species facing sharp declines, the bumble bee known to scientists as Bombus affinis has plunged nearly 90 percent in abundance and distribution since the late 1990s, according to the U.S. Fish and Wildlife Service. A rusty patched bumble bee is pictured in Madison, Wisconsin, U.S. Aug. 7, 2015. Today, only a few small, scattered populations remain in 13 states and Ontario, the Fish and Wildlife Service said. The agency in September listed seven varieties of yellow-faced, or masked, bees in Hawaii as endangered. But Bombus affinis is the first bumble bee species to given that status, and the first wild bee of any kind to be listed in the Lower 48 states. Bumble bees, as distinguished from domesticated honey bees, are essential pollinators of wildflowers and about a third of all U.S. crops, from blueberries to tomatoes, according to the Xerces Society for Invertebrate Conservation, which petitioned the government for protection of the insect. Pollination services furnished by various insects in the United States, mostly by bees, have been valued at an estimated $3 billion each year. 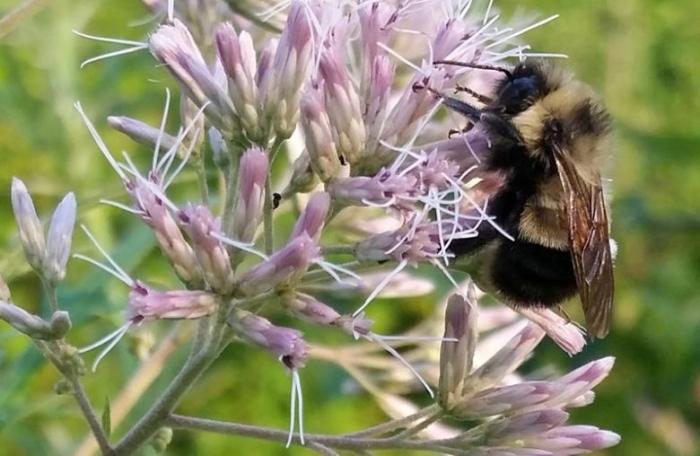 The International Union for the Conservation of Nature ranks the rusty patched as one of 47 species of native U.S. and Canadian bumble bees, more than a quarter of which face a risk of extinction. Government scientists point to a certain class of pesticides called neonicotinoids — widely used on crops, lawns, gardens and forests — as posing a particular threat to bees because they are absorbed into a plant’s entire system, including leaf tissue, nectar and pollen. Bumble bee populations may be especially vulnerable to pesticides applied early in the year because for one month an entire colony depends on the success of a solitary queen that emerges from winter dormancy, the wildlife service said. Listing under the Endangered Species Act generally restricts activities known to harm the creature in question and requires the government to prepare a recovery plan. It also raises awareness and helps focus conservation planning for the imperiled species.